During the last couple of weeks, the weather remained pleasantly warm in the low to mid 80’s. It’s the exact kind of weather to make me think of home. 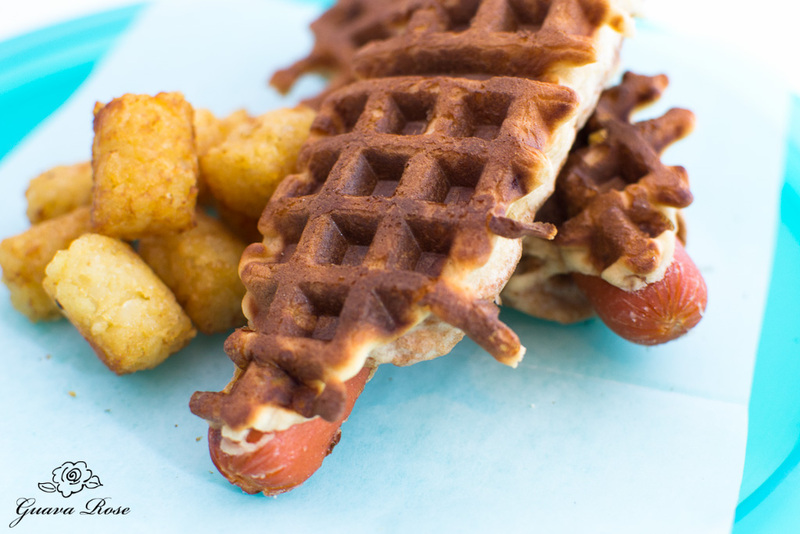 Warm sunshine, light breezes…make me feel like having… a waffle dog! Since we don’t have one of those lovely, special machines, and are quite far away, we’ll just see what we can come up with. Start with a really good quality hot dog. 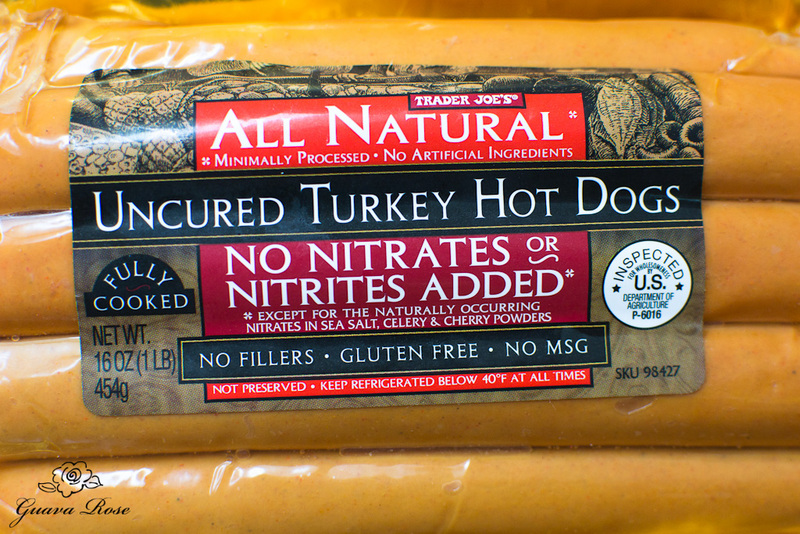 Try to stay away from ones with those pesky cancer promoting nitrates and nitrites. Trader Joe’s is a good place to get some reasonably priced uncured hot dogs. They have beef ones too, in addition to the turkey ones pictured above. They are both good, but I personally like the beef ones a little more. Most likely you will be able to find them in any large grocery store. I think more and more people are concerned about the issue, and are requesting their grocery stores to carry uncured hotdogs. Sometimes they are placed next to all the other regular hotdogs, and sometimes they are in the natural food section. 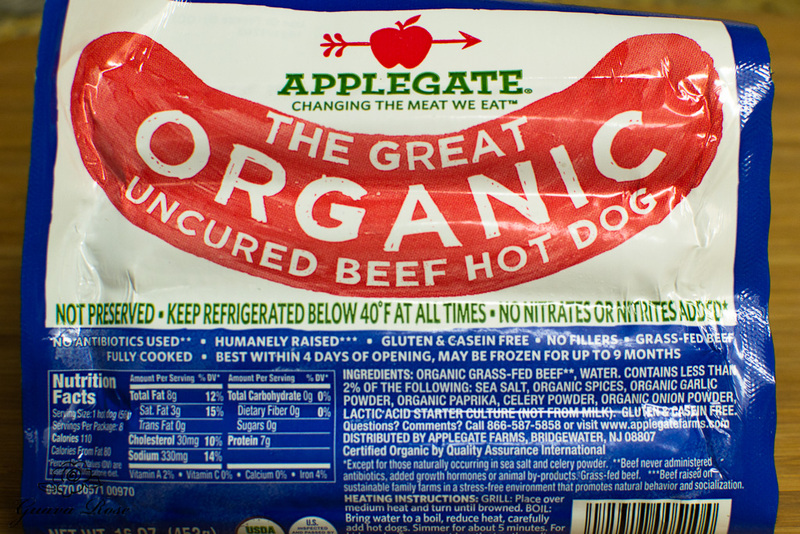 I bought the organic hot dogs above at one of the nearby grocery stores that I regularly shop at. 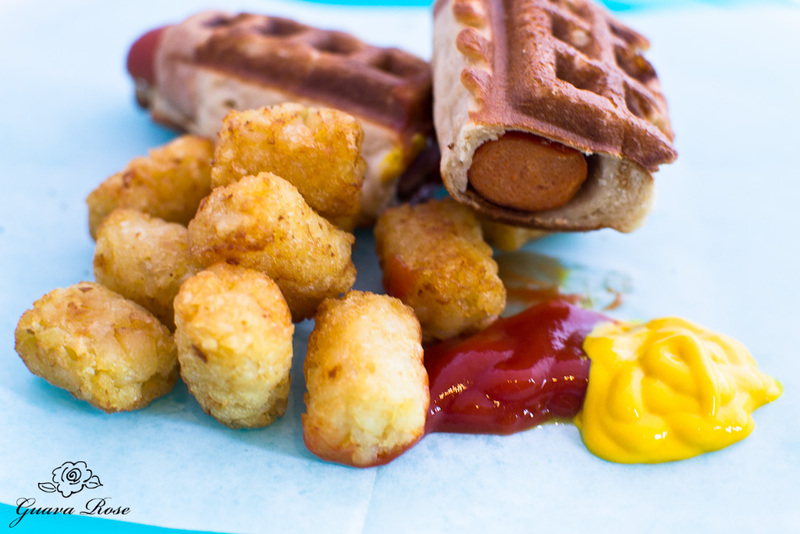 Of course you could also use veggie dogs and make vegetarian waffle dogs. One word of caution though–if you’ve never had a veggie dog before, try one first to see if you like them. Some brands taste better than others, but if you’re expecting it to taste like meat–it won’t. 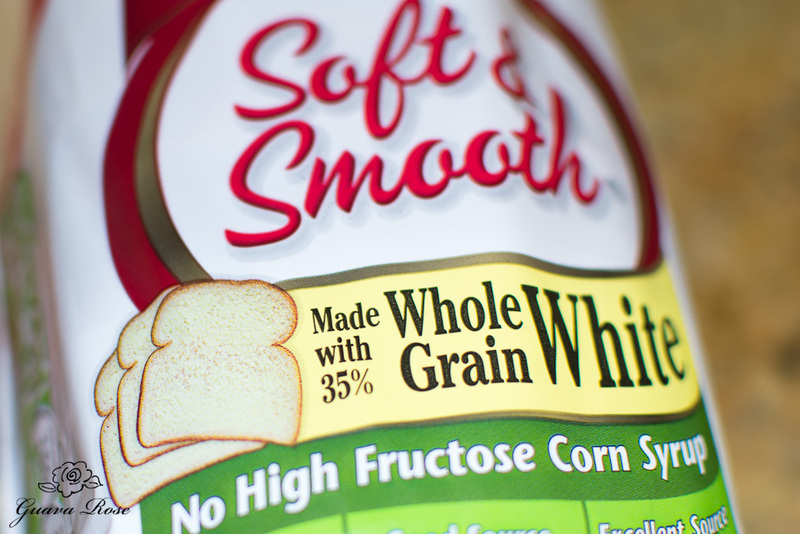 Whole grain white bread adds extra fiber, but is still nice and soft. Roll out each slice as flat as possible with a rolling pin. Yes, really. I know, doesn’t it seems wrong to smash such nice, soft bread? 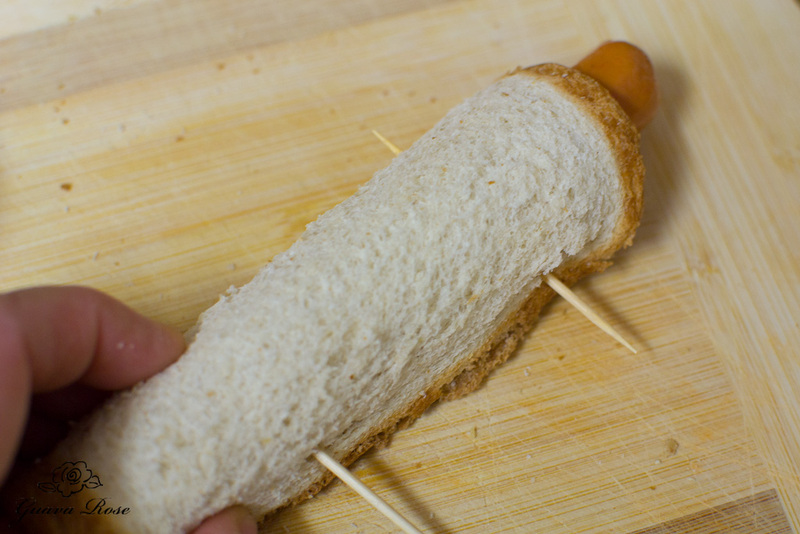 It’s okay though, doing that makes it easier to roll up the hot dog. 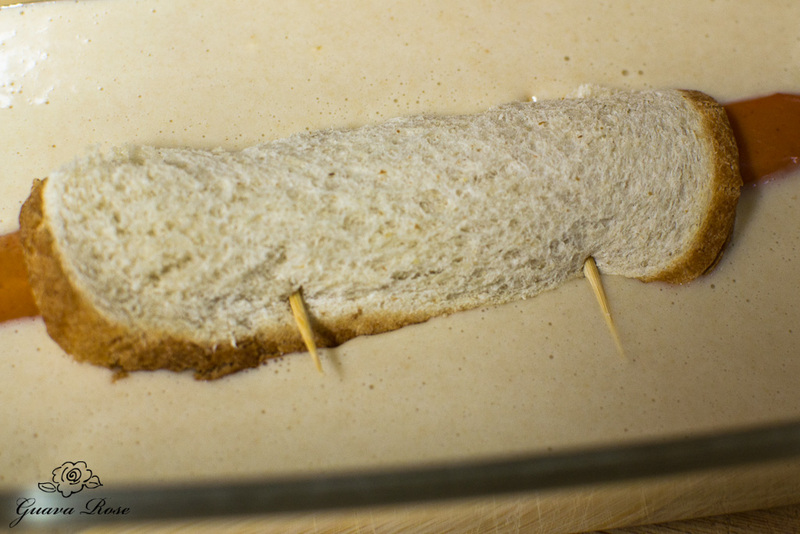 Secure the ending edge of bread with two toothpicks poked through the hotdog. If you are making a lot of these, they can be rolled far ahead of time and kept covered in the refrigerator until needed. Now for the waffle batter. Use a buttermilk pancake and waffle mix. Be sure to follow the directions for waffles, and not pancakes. The waffles usually have a couple of tablespoons of oil added to the batter, which is important in getting the waffle dogs as crispy as possible. If you forget and use a pancake batter, it will work, but it just won’t be really crispy. Unfortunately I’ve made these enough times to have forgotten once to add the oil–it was still good though! Putting it in a toaster oven afterwards helped. In fact, waffle dogs reheat really well. Microwave for 30-40 seconds first so the hotdog warms up, then crisp it one cycle in a toaster oven. The batter is a great place to sneak in some extra fiber too. Most fiber containing mixes are also reduced in fat, another bonus. 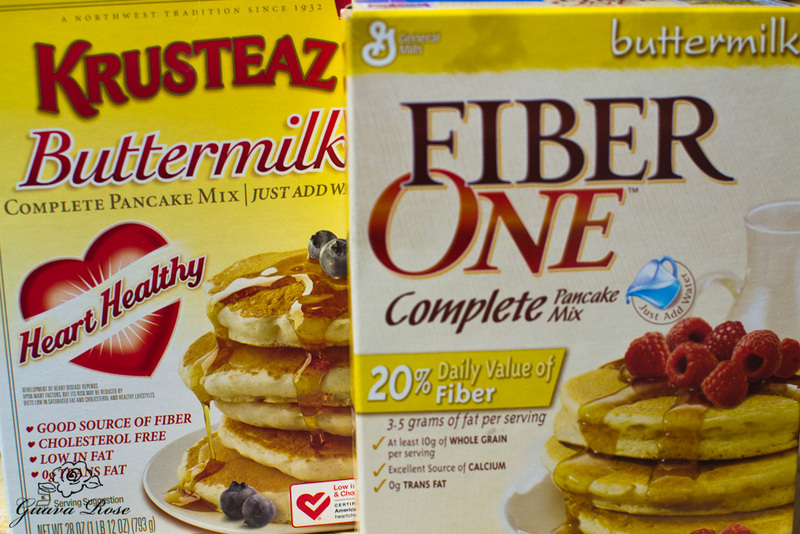 Some brands to try are Bob’s Red Mill, Fiber One, and Krusteaz (I like this one the best). The buttermilk mixes tend to taste better. 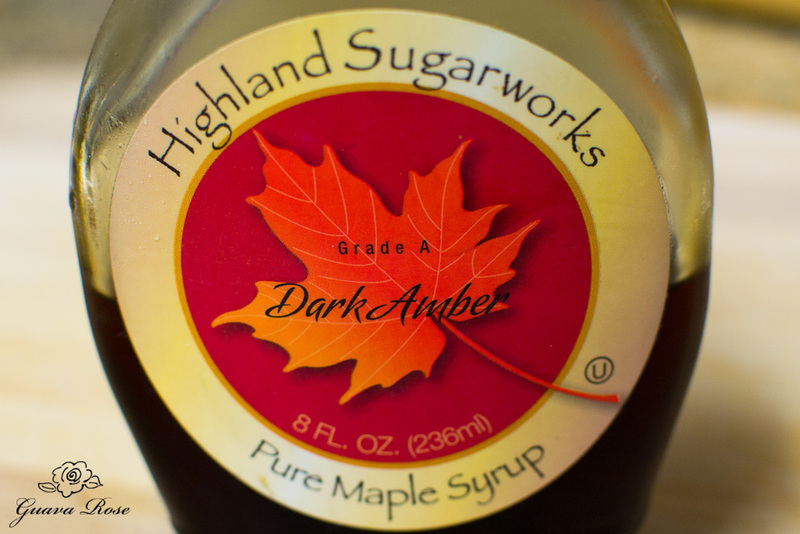 A few tablespoons of pure maple syrup or honey will give it that sweet and savory taste we all love. 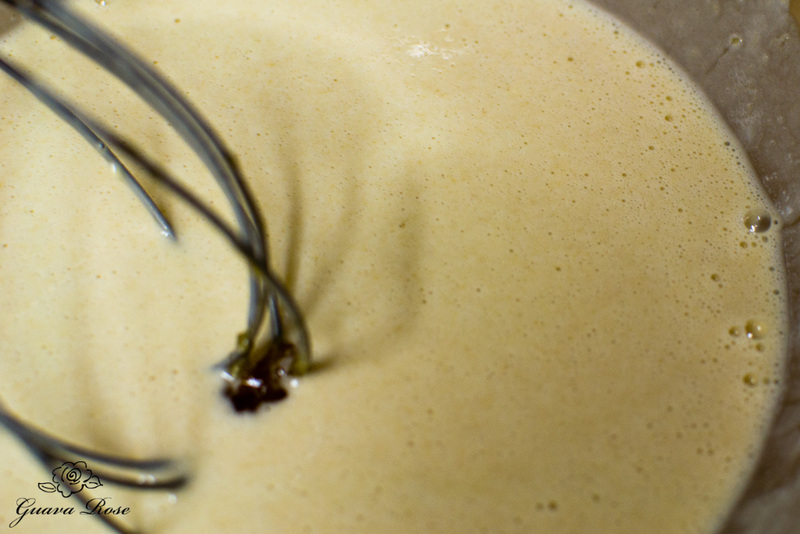 Whisk the maple syrup right into the batter. This combination waffle iron, grill, griddle that I bought on Amazon is perfect to use. 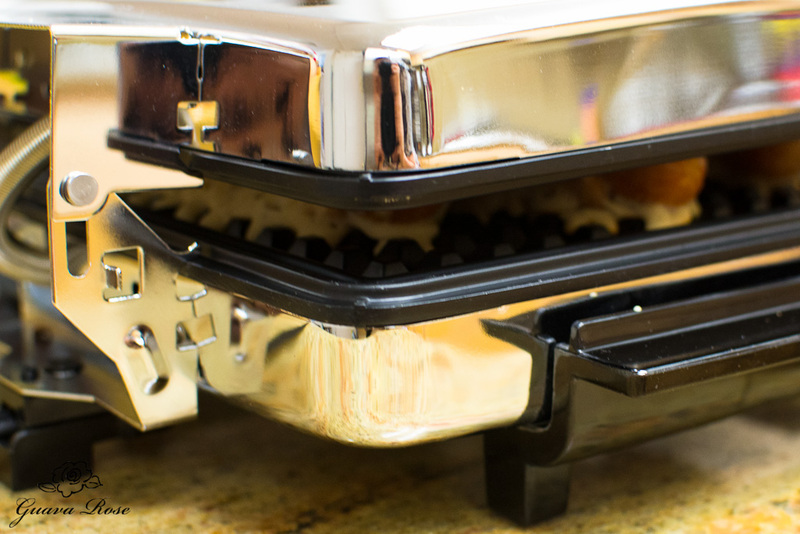 For the easiest and best results, you should use a waffle iron that has a “floating hinge.” That means the hinge can adjust to whatever thickness food is in the waffle iron. This particular model has removable plates that can be flipped over to a smooth side and used as a panini maker, in which the floating hinge is a necessity for adjusting to however thick the sandwiches are. 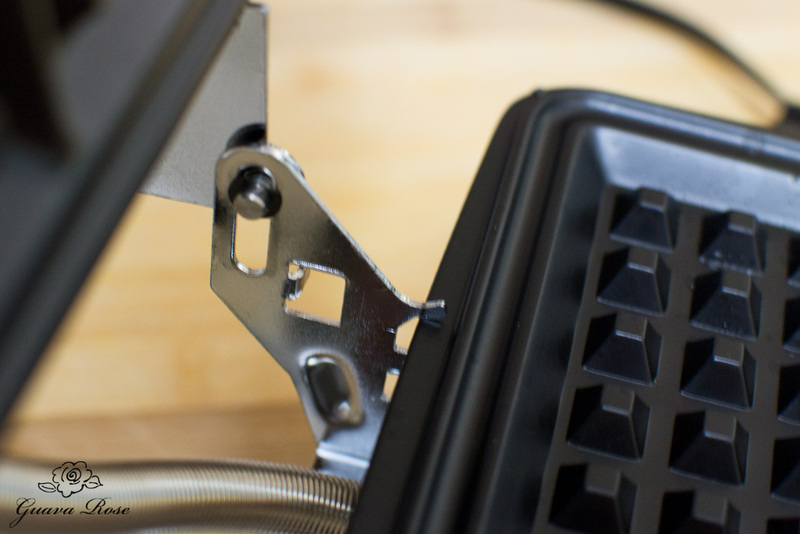 Here’s a close up of the floating hinge. That long oval channel allows the lid to move up and down. You could use a regular (not Belgian) waffle iron to make these waffle dogs, but you would only be able to cook them in the front half of the waffle iron, which may mean cooking one at a time. A regular hinge provides a tight “V” shape in the back of the waffle iron which doesn’t allow enough space to cook the waffle dogs. 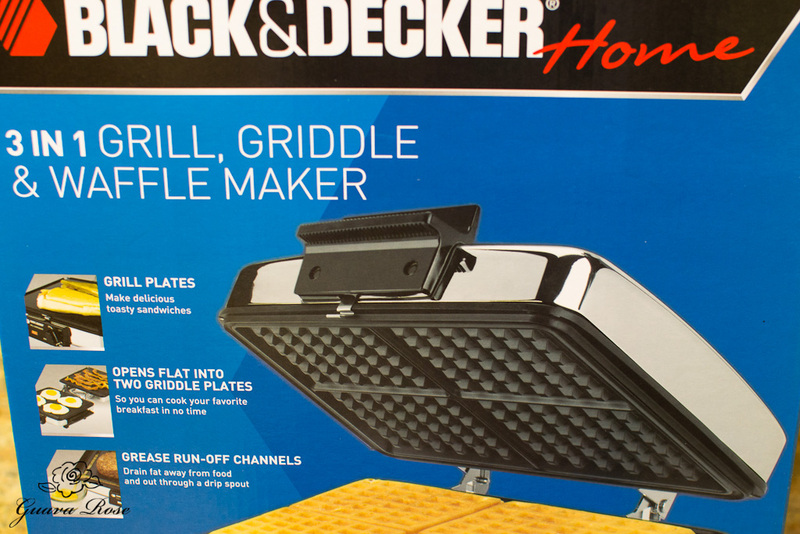 Preheat the grill to the waffle setting. 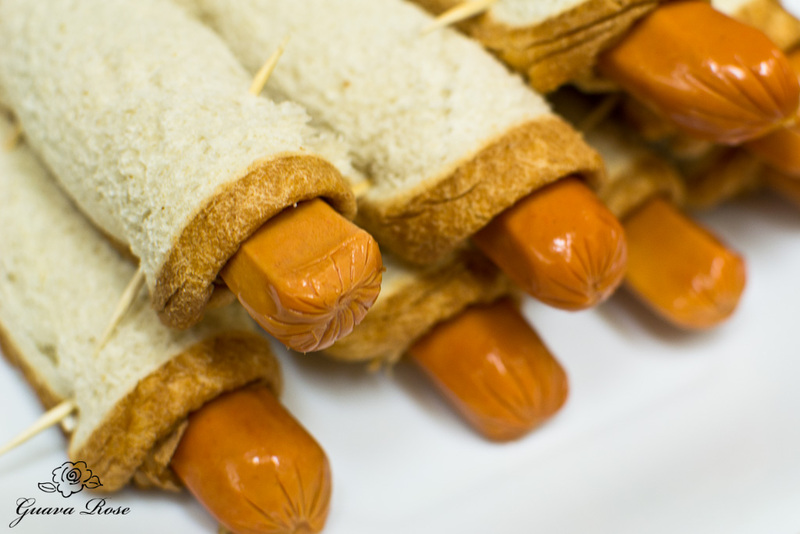 Use tongs to dip and coat each wrapped hotdog in the batter. Place about three at a time on the grill, so they aren’t crowded. Put down the lid and press gently intermittently. They will be done in about 5 minutes. Here are the lovely, golden waffle dogs, when you lift the lid up. Be sure to pull out all of the toothpicks before serving. Especially with kids, you don’t want them biting into something sharp. I always count my toothpicks to make sure I’ve gotten them all out. Sometimes their color allows them hide in the finished waffle really well. 8 waffle dogs x 2 toothpicks each = 16 toothpicks. 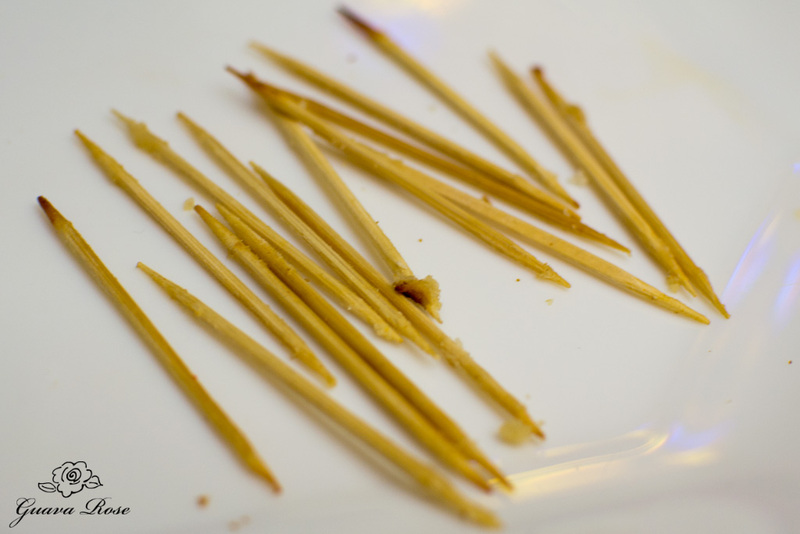 Yup–here are my 16 toothpicks. I know the original KC waffle dog has a smooth surface. That could be done that if I used the smooth panini grill plates, but I like all the ridges of the waffle plates. 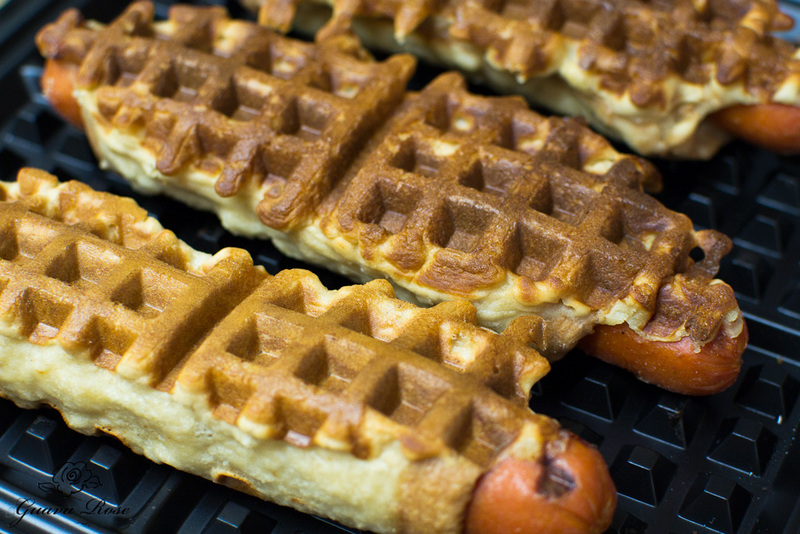 It allows a greater surface area on the waffle dog to be cooked and get crispy, and creates perfect little wells for ketchup, mustard and even relish. I slid some frozen spud puppies in the toaster oven right before I started the rolling process. They were hot and crispy just in time to meet the waffle dogs. All we need now is an ice cream slushie! 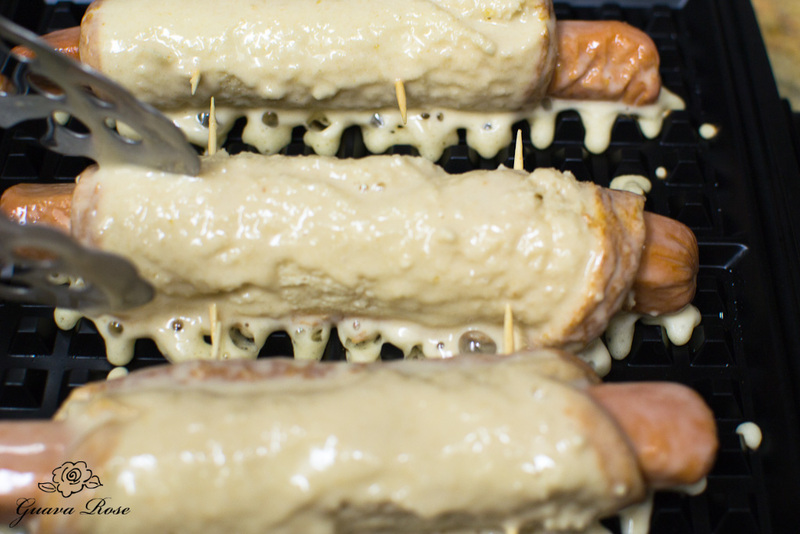 Juicy hot dogs grilled in a maple-waffle coating. 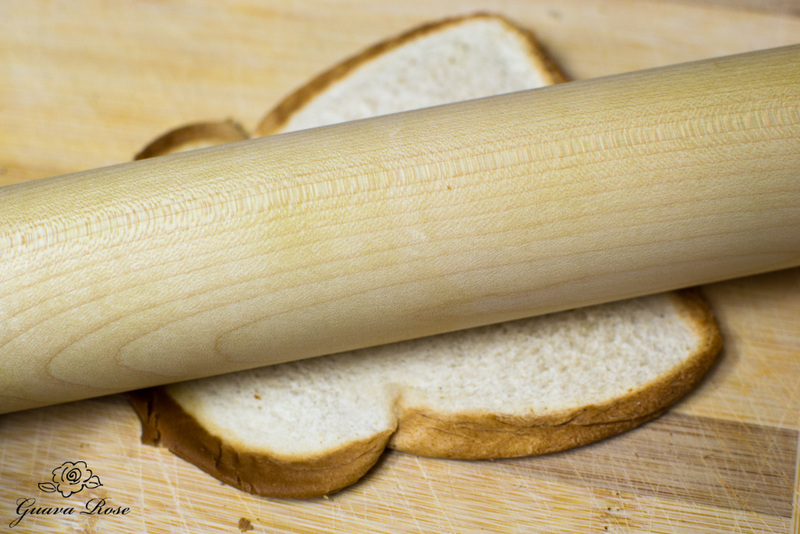 Use a rolling pin to flatten out the bread slices as much as possible. 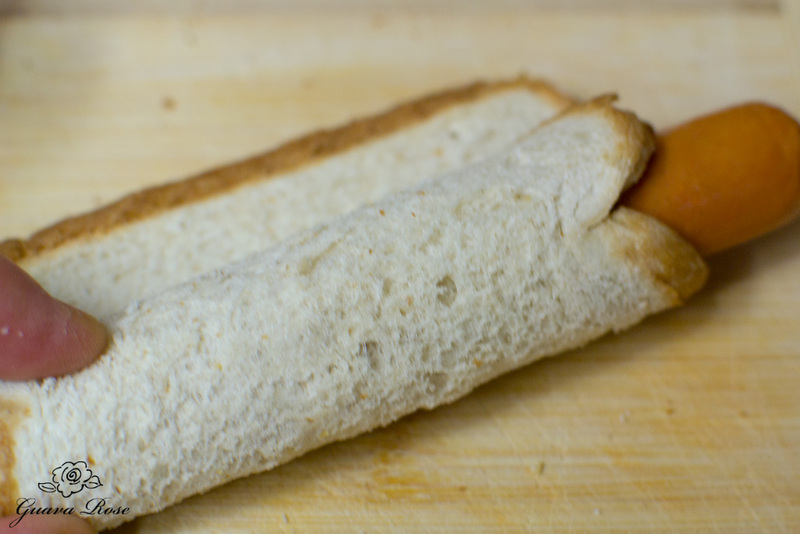 Roll each hot dog up in a slice of flattened bread, securing the ending edge with two toothpicks, placed about 3' apart, through the hotdog.